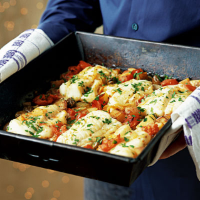 This variation on a classic Italian Christmas Eve dish is ideal to prepare ahead. The cracked olives, flavoured with garlic and chilli, add real richness. Preheat the oven to 200°C, gas mark 6. Melt the butter in a large flameproof roasting tin over the hob and cook the onion for a few minutes until beginning to soften. Add the garlic and potatoes and mix well with the onions. Stir in the tomatoes and, over a high heat, add the wine and bubble rapidly until reduced by half. Pour in the fish stock, add the olives and stir together well. Roast in the oven for 20-25 minutes, or until the potatoes are tender and the tomatoes have softened. Add the fish to the tin, nestling it among the potatoes and tomatoes. Spoon over some of the cooking juices and season lightly. Return to the oven and cook for a further 7-10 minutes, until the fish is just cooked through. Scatter with the parsley and serve immediately from the tin, with green beans and some warmed crusty bread such as focaccia. Prepare this dish ahead up to the end of paragraph 2 of the instructions and the flavours will intensify. Simply place in the fridge until needed then heat through in the oven for about 10 minutes before adding the fish.